As most phosphoproteins are present in low abundance, and have wide dynamic range, enrichment procedures before mass spectrometry analysis are usually necessary for detecting phorsphoproteins. MtoZ Biolabs provides various enrichment methods, according to specific experimental objectives. 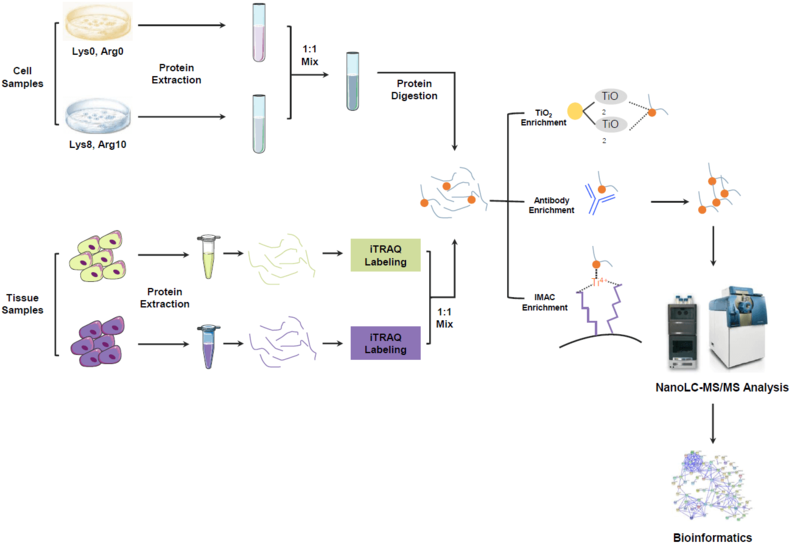 TiO2 and IMAC enrichment can be employed for enriching the total phosphorylation proteome, and phosphor-Ser/Thr or phospho-Tyrosine antibodies can be applied to analyze specific targeted phosphoproteome. Additionally, we also provide iTRAQ/TMT protein labeling service to further increase the accuracy of quantitative phosphoproteomics analysis. Based on our well-established phosphoproteome analysis platform, MtoZ Biolabs can provide an accurate all-inclusive service package, including protein purification, digestion, protein labeling, phosphoprotein enrichment, MS analysis, and bioinformatics analysis. All you need to do is to tell us your project objective, and send us your cell samples, and we will complete all the following experiments.